Staffan de Mistura, Special Envoy for Syria briefs the media in Geneva. 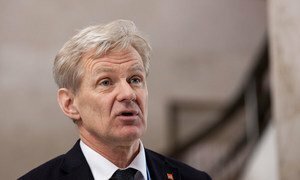 As the first week of the new round of intra-Syrian talks ended today, the United Nations Special Envoy for Syria said the “proximity system” of the discussions, whereby parties are meeting indirectly through his mediation, has contributed to the talks moving forward. “No walk-outs, no excessive rhetoric – some discussions but not excessive rhetoric – no breakdowns, in spite of the fact that I am still obviously detecting large distances, but that is part of why you have talks, or consultations or negotiations, otherwise we would have had one nice signing ceremony, which is not yet the case,” Staffan de Mistura told reporters in Geneva. Mr. de Mistura noted that he also had a short “acquaintance meeting” with a group of individuals from Damascus and inside Syria. “As you know the Security Council resolution is very clear in terms of the mandate I am given. I am supposed to consult anyone who has something to say in order to be able to move forward on what has been and should be the Intra-Syrian talks, and eventually serious negotiations,” he explained. He also met with the Government which “reiterated its own interest in having a commonly shared list of principles.” Mr. de Mistura said identifying “the grey zone of areas of common ground” will be the focus early next week, when the talks continue: “Now principles are not just principles, they are the basis for then getting deeply into what we consider a common ground for what is the mother of all issues, which is the mandate for the political transition, no question on that,” he stressed. Finally, the UN envoy met with the High Negotiations Committee (HNC) opposition group, which has reportedly already produced substantive papers. “They had gone deeper and I must say I am quite impressed by the level of depth in which they have been ready to engage the facilitator, the mediator, my team with substantial points regarding their own vision of governance, hence political transition,” he indicated. Turning to the question of detainees, the UN envoy said it was raised and is “unquestionably a crucial one.” He insisted that in addition to the delivery of humanitarian aid, it is essential to bring people back to their families, regardless of what side they are on. Meanwhile, by this time next week– the last week of the second round of the talks – Mr. de Mistura said the aim is to build “a minimum common platform” of not just principles but points that could lead to a better understanding of the direction in which the political transition is going. “In my opinion, [this] will be the main focus of the next meeting, which will be in April, and we are already aiming very clearly for that,” he said. The advisor to the UN envoy on Syria today stressed the need to obtain Government permits to dispatch aid convoys to the remaining six of the 18 besieged locations and stressed that “the issue of medical relief continues to be the single most difficult issue in humanitarian access work,” with medical items and personnel are being taken off the relief vehicles.